17-Aug-2004 -- Having done N48 E14, N48 E15 N48 E16 yesterday, today we would have a easy day and visit CP N48 E17. A short journey east from Vienna on the A4 towards Budapest took us via Parndorf and Gattendorf to the CP before reaching Zurndorf. On the way we saw what seemed like hundreds of Windmills in all directions. 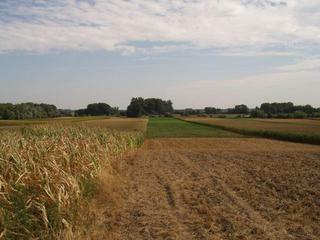 It could be seen from the main road along side a sweet-corn field. We headed down along the left side of the field as directed by the GPS. After a 100 metres or so it was obvious that we were on the wrong side of the field. Rather than go back to the road and try again on the other side, and not wanting to trudge through the crops we walked to the end of the field, cut across and came back on the correct side. Luckily we didn't have any mud to deal with. Once there, it was a couple of steps into the cabbage field. We took the usual photos and headed back to the car. Rather than head back to Vienna we headed north to Petronell-Carnuntum and visited the Heidentor and one of the Roman amphitheatres located there. From there we crossed north over the Danube just before Hainburg, and travelled back to Vienna visiting the Donauauen National Park at a small village called Schoenau a.d. Donau. Then it was back to Vienna and some inline-skating on the Donauinsel.